When Iranian President Mahmoud Ahmadinejad tours Lebanon’s border with Israel today, he may pause a moment to consider that Iran owes its existence as a Shiite nation to the ancestors of those living in these rural hilltop villages. In the early 16th century, the center for Shiite scholarship was in an area known as Jabal Amil, a rugged hill country that conforms closely to the geographical perimeters of modern-day south Lebanon. When Shah Ismael I, the Safavid ruler of Iran, introduced Shiism as the state religion in the 16th century, he turned to the scholars of Jabal Amil to help promulgate the new faith…. Qifa Nabki does his usual good job explaining popularity polls in the Arab World and in particular why both Ahmadinejad’s and Nasrallah’s stars dimmed after 2008 and why Turkey’s Erdoghan and Venezuela’s Chavez shone so brightly. Nasrallah was the real star of the show. …. Nasrallah spoke mindfully of his larger audience in Lebanon, and tried the novel approach of presenting Iran’s foreign policy as “unifying”. He praised Iran’s supreme leader, Ayatollah Ali Khamenei, for issuing a fatwa forbidding Muslims to react to the Qur’an burning-fiasco in the US with “similar acts”, claiming that Iran was acting in the best interests of Christian-Muslim unity. He also congratulated the Iranian cleric for his handling of a highly controversial London conference in which a little-known Shia activist disparaged Aisha, the wife of the prophet Muhammad, who is highly revered by Sunnis but considered a traitor by many Shias. Iran’s supreme leader Khamenei had responded with a statement forbidding insulting talk about the wives of the prophet, thereby – according to Nasrallah – acting as a force for unity between Sunnis and Shias. Lebanese leaders portray his visit as routine as thousands turn out to greet him in Beirut’s pro-Hezbollah Shiite areas. An open letter urges him not to interfere in internal matters through Hezbollah. ……. Officials of the two nations signed humdrum trade agreements, praised one other and ate lunch at the palace of President Michel Suleiman. Ahmadinejad presented Suleiman with a gift: a computer equipped for nanotechnology research. But from the beginning, the choreography of Ahmadinejad’s trip overshadowed his carefully chosen words. Emphasis was on Iran’s relationship with Hezbollah, which operates as a state-within-a-state and sometimes eclipses the power of the Lebanese government. Arriving with an entourage that filled two Boeing 707s, the Iranian president declined to take an official helicopter ride from the airport to the presidential palace in the Beirut suburb of Baabda. Instead Ahmadinejad opted for a slow-moving convoy of black SUVs that waded through huge roaring crowds waving Iranian flags in the mostly Shiite southern suburbs of Beirut. Hezbollah security forces guarded the way. Standing through the car’s roof, Ahmadinejad waved at the crowds who showered him with flowers and sweets. Hezbollah took the liberty of canceling grammar school classes in southern Beirut so children could attend. After the stuffy luncheon with the suits, Ahmadinejad broke free from his official entourage and basked in the adulation of massive crowds in southern Beirut, a Hezbollah stronghold. According to Hezbollah’s broadcasting network al-Manar, before departing the country, Ahmadinejad met with Hezbollah Secretary-General Hassan Nasrallah at the Iranian embassy in Beirut and received a gift from him – the personal weapon of an IDF soldier seized during the Second Lebanon War. And I demand of some of the countries in our region (Moderate Arabs I assume) to understand and to allow its people to support the Palestinian people as they wish to … Any party that tries to normalize with the Israeli entity will be isolated. Stratfor: From the Syrian point of view, Lebanon is not just a natural extension of Syria; it is the heartland of the Greater Syria province that existed during Ottoman times. Since the days of Phoenicia, what is modern-day Lebanon has been a vibrant trading hub, connecting routes from the east and south to the Mediterranean basin. For Syria to feel like it has any real worth in the region, it must dominate Lebanon. What a great man from a great nation. As Israeli bombs killed hundreds of Lebanese in the summer of 2006, then-U.S. Secretary of State Condoleezza Rice told the people of Lebanon that they were simply experiencing “the birth pangs of a new Middle East.” That new Middle East was on view during the two-day visit to Lebanon this week by Iran’s President Mahmoud Ahmadinejad – and it looks nothing like the vision pursued by the Bush Administration’s military-driven strategy of dividing the region into “moderate” and “radical” camps locked in a fight to the finish. Part of Ahmadinejad’s agenda was simply to strike a defiant pose, affirming Iran’s “resistance” posture and saluting its Hizballah protege for successfully resisting the 2006 Israeli invasion the Islamist group had provoked by snatching Israeli troops from across the border. The presence of the Iranian President, Israel’s self-styled nemesis, declaring in the border town of Bint Jbail that “the Zionists will eventually disappear,” may also have been intended to warn Israel off attacking Iran. Tehran has equipped Hizballah with a massive missile arsenal that many believe would be the first line of retaliation should Israel attack Iran’s nuclear facilities. Ahmadinejad’s visit could, in fact, be deemed something of a belated victory lap celebrating the collapse of the erstwhile U.S. strategy. The Bush Administration may have hoped that its own invasion of Iraq and Israel’s attacks on Lebanon in 2006 and Gaza in late 2008 would strike decisive blows against Iran and its allies and turn the regional dynamic in favor of the U.S. But in all three places, Iran’s influence was actually strengthened. If Prime Minister Nouri al-Maliki succeeds in winning a second term in office in Iraq, he’ll owe his reelection to Iran’s intervention to win him the necessary backing from its Shi’ite political allies. The U.S. may have hoped that Israel’s 2006 offensive would finish off Hizballah but the movement is both militarily stronger and more firmly entrenched in Lebanon’s body politic than ever before, with an effective veto power over government decisions. And neither the Israeli military campaign that began in the final days of 2008 nor the economic blockade of Gaza has managed to dislodge Hamas, while Washington’s own Palestinian ally – President Mahmoud Abbas – has grown steadily weaker. So, while the U.S. fretted that Iran, through its support for Hizballah, was undermining Lebanese sovereignty, it lacked the clout to persuade a Lebanese government led by pro-Western parties to block Ahmadinejad’s visit. Instead, tens of thousands of Lebanese, mostly Hizballah supporters, turned out to salute their movement’s patron. But the Iranian president didn’t confine himself to huddling with Hizballah. He also met with Lebanon’s Christian president, Michel Suleiman, and also with the Saudi- and U.S.-backed Sunni prime minister, Saad Hariri. The latter meeting was particularly significant, because Hariri leads a coalition that has fought against Syrian and Iranian influence in Lebanon through Hizballah. And a U.N. investigation into the 2005 murder of Hariri’s father, former Prime Minister Rafik Hariri, is believed to be planning to accuse members of Hizballah of the killing. Hizballah has denounced the investigation as an Israeli plot, and has warned that any move against Hizballah could bring down Hariri’s government, causing political chaos and quite possibly renewed violence. The leaders of Syria (which backs Hizballah) and Saudi Arabia flew to Beirut together in the summer, in an unprecedented show of unity aimed at dissuading their Lebanese allies from allowing the Hariri murder probe to disrupt the country’s fragile stability. While Ahmadinejad’s presence could be read as reinforcing a “don’t-touch-Hizballah” message, he also appears to be placing a heavy stress on Lebanese unity and the need to avoid division. And he reportedly canvassed Saudi, Syrian and Jordanian leaders ahead of his trip. So he may be hoping to consolidate Iran’s regional gains by signaling an intention to avoid intra-Arab confrontation in Lebanon. After all, while they will push back against Iran’s role in the Arab world, even Arab regimes that are allies of the U.S. are forced by the relative strength of Tehran’s allies there – Hizballah in Lebanon, Hamas in Gaza and the Shi’ite parties in Iraq – to seek a pragmatic modus vivendi that acknowledges Tehran’s influence. President Bush’s idea that the region’s radicals could be eliminated in a winner-takes-all showdown has proven to be a chimera. DAMASCUS – After a 14-month absence, Iraqi Prime Minister Nuri al-Maliki returned to Damascus on Wednesday, turning a page with the Syrians after he provoked a diplomatic crisis with them last August. The former Damascus resident, hours after returning from a similar visit to that capital, accused the country of harboring Iraqi Ba’athists that allegedly carried out a triple bombing in Baghdad that killed over 100 civilians. The Iraqi ambassador was quickly withdrawn from Damascus – only to return last Sunday, three days ahead of Maliki’s visit. For weeks, positive gestures have been exchanged between Damascus and Baghdad, and Maliki’s visit was an expected culmination of the warming relations. The rapprochement begun with a visit by Maliki’s government spokesman Ali al-Dabbagh in August, and was followed by a phone conversation between Maliki and his Syrian counterpart, Prime Minister Naji al-Ahmed, in September. A senior delegation from Maliki’s State of Law Coalition (SoL) then went to Damascus, followed by the return of Iraq’s ambassador on October 10. Maliki’s visit to Syria comes amid a prolonged political crisis in Iraq that has lasted since its March election. Many believed that Syria and Saudi Arabia would ensure that Maliki was replaced with former premier Iyad Allawi, who had won a majority of 91 seats in parliament in the vote. However, neither Allawi nor Maliki have since been able to form a majority and end the stalemate. Allawi is strongly allied to the Sunnis and preaches a secular agenda that differs greatly from the religious path Maliki has drawn since he became prime minister in 2006. The Saudis saw Maliki as a sectarian politician bent on empowering Shi’ites at the expense of Sunnis, while Syria was furious with Maliki for what happened in the summer of 2009. Disappointed with Maliki, Syria saw him as an ungrateful neighbor who had blamed Syria for those infamous bombings to cover up for his own faults in managing Iraq’s security. The Syrians had hosted Maliki in Damascus for more than 10 years, adamantly refusing to extradite him during the Saddam Hussein era. When he became prime minister a Syrian embassy was opened in Baghdad, helping legitimize Maliki in the eyes of ordinary Iraqis – especially Sunnis. This also helped promote him in Arab circles, where he was seen as a creation of the Iranians. Taking his cue from the Middle East neighborhood that was seemingly very hostile to Maliki, Allawi invested in a relationship with the Syrians and Saudis. By September, however, Arab capitals had reasoned that Allawi would never make it to the premiership, regardless of how many seats he commanded in parliament. Simply put, he could not form a cabinet on his own – needing a total of 163 seats – which his Iraqi National List did not have. Coinciding with this shift in Baghdad were several back-to-back visits by Iraqi players to Damascus, including Vice President Tarek al-Hashemi, Shi’ite cleric Muqtada al-Sadr, Ammar al-Hakim of the Supreme Iraqi Islamic Council (SIIC), and Allawi, who was in Syria two weeks before Maliki’s visit. The Syrians made it clear to all their visitors – Maliki included – that they would not interfere at a micro-level in Iraqi politics, stressing nevertheless that any government needed to include all parties, Shi’ites, Sunnis and Kurds. The Sunnis and Kurds have to date been reluctant to support Maliki’s bid for office, for different reasons. The Sunnis did not trust Maliki, who had reneged on all promises made to them in 2006. He has not issued a political amnesty to set thousands of Sunnis free, done nothing about repealing the infamous de-Ba’athification laws that were passed in 2003, and repeatedly failed to disarm Shi’ite militias. He persecuted armed Sunni tribesmen, known as the Awakening Councils, and refused to empower Sunnis within the government. When they collectively walked out on him in 2007, he did not lift a finger to appease them. Only Syria can talk them into a change of attitude today, Maliki has reasoned, offering to grant concessions that he had repeatedly refused since 2006. Syria has the ear of influential Sunnis – tribesmen, notables and former Ba’athists – and can talk them into a u-turn if Maliki agrees to give them proper representation in any new government. He would also need to issue the general amnesty, revoke the anti-Ba’athification laws, and take serious action against armed militias, be they Sunni or Shi’ite. Maliki appears to have reasoned that it was foolish – to say the least – to cross the Syrians over a matter that did not concern them. After all, the August bombings were followed by similar horrific attacks in October and December 2009, proving that the root of the problem was security in Iraq itself, and not Iraqi fugitives living in neighboring Syria. By blaming it on the Syrians, Maliki actually enabled the real culprits – al-Qaeda – to repeat the same terrorist stunt within a four-month interval. The group reasoned, having got away with it in August, that Maliki would be incapable to stop them as this would entail admitting that security was completely lacking in Iraq. Maliki also reasoned that just like having a Syrian ambassador in Baghdad did wonders to his image in the eyes of Sunnis, withdrawing him in 2009 had the exact opposite effect. Legitimacy granted – legitimacy withdrawn – is how Maliki viewed his diplomatic row with Damascus. It was one thing to be recognized by a pro-Western country like Jordan, for example, but something completely different when this legitimacy is granted by a country like Syria that still preaches a strong brand of Arab nationalism and continues to champion the Palestinian cause. Shortly before the Maliki visit, Allawi seemingly threw in the towel, agreeing to support a different candidate for the premiership – Adel Abdul Mehdi of the SIIC. Allawi’s chances of becoming prime minister, amid the new mood in the Arab neighborhood and within Iraq itself, have seemingly shrunk to very low levels. Maliki has offered him a seemingly perfect exit strategy – the post of speaker of parliament in exchange for supporting Maliki’s bid for another term. With Syria willing to give Maliki the benefit of the doubt for another round in office, several of Syria’s allies in Iraq are likely to follow suit, including Sunnis, Kurds and Muqtada. Maliki has to live up to this new deal by seriously engaging all parties in the cabinet formation, making sure not to repeat the mistakes of 2006-2008. If not, he risks losing Syrian support all over again. This is brave stuff. I dearly hope they can survive the US / Israeli onslought when / if it comes. وعليه، فإن القراءة الأولية تقول إن نجاد هرع للبنان ردا على الزيارة التاريخية التي قام بها كل من العاهل السعودي الملك عبد الله بن عبد العزيز والرئيس السوري بشار الأسد للبنان على متن طائرة واحدة. وبالتالي، فإن الإيرانيين الذين من الواضح أنهم قد ضاقوا ذرعا بالتصرفات السورية، بل وأكثر، ولذلك مقال آخر، قرروا أن يأتوا علنا هذه المرة، ووحدهم، لنجدة نصر الله أمام استحقاقات محكمة الحريري الداخلية. وهذا ما يظهره خطاب نجاد في ضاحية بيروت الجنوبية، وهنا من المهم أن نتذكر الدهشة التي بدت على وجه حسن نصر الله يوم خرج بخطابه الشهير قائلا «لقد برأوا سورية» لنفهم القلق الإيراني على الحزب اليوم. It was obvious since then … but this week’s visit made it easier for more people to notice the new reality. Ahmadinejad’s visit “suggests that Hezbollah values its allegiance to Iran over its allegiance to Lebanon,” White House spokesman Robert Gibbs said on Wednesday. Gibbs’s analysis is part of an effort by the Obama administration, along with some Arab and Lebanese critics of Hezbollah, to portray the Party of God as primarily an Iranian proxy. While Hezbollah has become more reliant on Iran in recent years, it is a mistake for Western and Arab policymakers to think they can undermine the movement’s base of support by casting doubt on its Arab or Lebanese identity. This approach also reflects a misunderstanding of Shiite history in Lebanon and why that community has grown so dependent on Hezbollah.
. A call for radical change in US Middle East Policy. By Charles Freeman. I was in specifically referring to the way he did not change his tone after going back to Iraq, like he did after last year’s visit to Damascus. I agree with most of Sami’s conclusions about Syria’s role in Iraq. Syria is indeed quite influential, but not to the degree he described it. أما عن لبنان وما انتهت إليه مشاكله الأخيرة فيقول فيسك: منذ وقت طويل توصلت إلى استنتاج أن محكمة الأمم المتحدة بشأن اغتيال الحريري لن تتوصل إلى استنتاج. لقد مر أكثر من خمس سنوات منذ اغتياله في الرابع عشر من فبراير عام ألفين وخمسة، ولا بد من أن هذه أطول فترة تحقيق في التاريخ، وخلال هذه الفترة اختلطت السياسة بالتاريخ في الشرق الأوسط؛ فسوريا التي من المفترض أنها كانت جزءا من محور الشر مع إيران وكوريا الشمالية صار رئيسها، بشار الأسد، يُدعى إلى احتفالات الباستيل وعاد الدبلوماسيون الأميركيون إلى زيارة دمشق. ومن ثم لم يعد من المناسب سياسياً القول إن السوريين قتلوا الحريري. الأمر ليس مباراة كرة قدم لكنك تشعر بأنه كذلك أحياناً، بطريقة دموية جداً، ثم يدخل إلى الصورة زعم جديد: «آه، حزب الله وراء الاغتيال»، وأنا لا أعتقد ذلك؛ لأن حزب الله أذكى كثيراً من أن يتورط في جريمة قتل مفضوحة كتلك. أذكر أنه عندما قُتل الرئيس معوض كنت في مسرح الجريمة في ثوانٍ معدودة حيث كان يقف حراسه. سألت صديقاً: «محمد، من قتله؟» فقال: «لبنان قتله». دعنا نتأمل إذاً: هل كان لدى سوريا أو الإيرانيين أو حزب الله سبب لقتل الحريري؟ لقد كان لديه منافسون في مجال التجارة والأعمال كثـيرون. ثم يأتينا زعم آخر من إيران أنه كانت لديه صفقات تجارية مع إياد علاوي، وأنه كان التقى علاوي ذلك الصباح وأن صفقة أسلحة قد فشلت، إلى آخره. والحقيقة أن علاقات الحريري المتشعبة تسمح لك بأن تتخيل أن أي أحد يمكن أن يكون عدواً، وهذا ما يريد لنا قتَلَتُه أن نعتقد. لقد قتله أحد ما، والقنبلة كانت حقيقية، لكن للأسف كل ما تستطيع قوله هو اننا لم نحل لغز أي من الاغتيالات السياسية التي شهدها لبنان منذ نشأته عام ستة وأربعين، وأن أحداً لم يُقبض عليه ولا قُدّم أحد للعدالة في أي اغتيال سياسي أبداً، ولن يحدث. “A signature Israeli taunt during Iran’s Presidents visit was the launching of hundreds of blue and white balloons to catch the air current north to Bint Jbeil when Ahmadinejad was appearing. Spreading “sh*t as insulting artit seems has become the symbol of Israeli Jews. DAMASCUS, Oct. 17 (Xinhua) — Syrian President Bashar al-Assad will pay a visit to Saudi Arabia on Sunday to hold talks with Saudi King Abdullah Bin Abdulaziz, Syrian news website Syria Now reported. The two leaders will discuss major regional and international issues in addition to the bilateral relationships between the two countries, said the report. Relations between the two countries have been strained since 2005 due to the accusation against Syrian of assassinating former Lebanese Prime Minister Rafic Hariri in 2005, a close Saudi ally in Beirut. 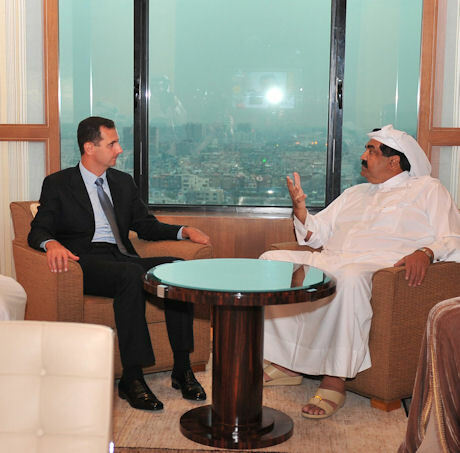 However, Assad paid a visit to Riyadh in January, 2010, showing the relationship between the two countries has thawed. In July, Assad and King Abdullah paid an unprecedented joint visit to Lebanon in a bid to ease the tension between the Lebanese political powers over the international tribunal’s reports on the investigation of the assassination of Rafic Hariri. Better to Tareq Al-Houmayed to work as a janitor (even janitors have a professional conscience more than he does) than to write dumb commentaries in the Saudi rag published in London. Hell, but why not? Half of the Saudi “royals” are either illiterate like the so-called king Abdullah who can’t even talk straight Arabic or literally dumb who buy their diplomas from UK and US universities, like others “royals” in the Gulf. Can the dumb editor in chief Tareq Al-Houmwayed tell his readers how can a table stand on two feet and not on three! As for the sectarian issue, his Wahhabi rag has been publishing hateful pieces directed against Muslim Shiites and against all those who oppose the US-Zionist-Wahhabi alliance in the Arab world for the last five years. Crocodile tears he is shedding. And the emir of Qatar has one too! in the next 6 weeks, one subject will be talked about a lot,Lebanon and the tribunal. I do not think Iraq crisis is solved yet. Hahaha. A nice table. I take it. But it has a base. Thanks for posting Zvi’s article, I missed it. No other Israeli journalist understands the Arab world better than Zvi Bar’el. In short, Lebanon, that little country that has no intrinsic strategic significance, served well as the region’s boxing ring. Fierce contests for control and hegemony are being fought in that arena – in particular, a cold war between certain Arab states on one side, and Iran and its allies on the other; between the so-called “pro-Western” and “anti-American” axes. Alex add greetings to those of Norman. Trust Creative Syria is doing well. Ghat, some of these settlers who terrorize the occupied Palestinians and who are obviously supported (financially and much more) by Israel are … “terrorists”. Therefore, Israel should be on the list of countries that support “terror”. Syria has been asking the United States to sit with the rest of countries in the Middle East to produce a definition of “terror”. But there is no interest from the Americans. However, the link you provided has one image that should not be there. It is done by a Spanish artist and has nothing to do with Israel. does fisk take directions from hariri. syria is having fun with amurderka. to ask the leading terrorist to define terror is pricking the pig. The US claims that its forces in Afghanistan have the right to cross into Pakistan in pursuit of “militants.” Recently US helicopter gunships killed three Pakistani soldiers whom they mistook for Taliban. Pakistan closed the main US supply route to Afghanistan until the Americans apologized. In his book, “Obama’s Wars,” Bob Woodward reports that America’s puppet president of Pakistan, Asif Ali Zardari, believes that terrorist bombing attacks inside Pakistan for which the Taliban are blamed are in fact CIA operations designed to destabilize Pakistan and allow Washington to seize Pakistan’s nuclear weapons. Most Americans believe that their government is the best on earth, that it is morally motivated to help others and to do good, that it rushes aid to countries where there is famine and natural catastrophes. Your forgot to add that “most Americans” vote. I wish I could say the same about Arab countries.